A couple of years ago I travelled to the Deep South, to ski Argentina, experience the Latin culture and explore the mountains. Having worked with many Argentineans in Whistler and hearing the stories of deep snow and amazing terrain, I was determined to teach myself some basic Spanish and try out a new southern hemisphere ski resort destination. I spent a few weeks in Bariloche where early season rain had closed much of Cerro Catedral resort. 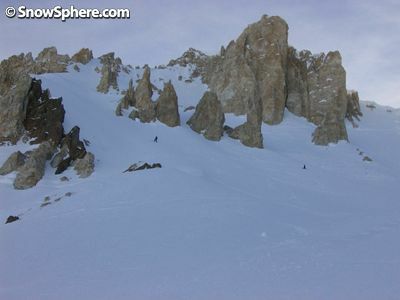 My friend and I decided to head north in hope that Las Leñas was in better shape. What greeted us wasn't the whitest mountain; snow had been lean here too in the early season. 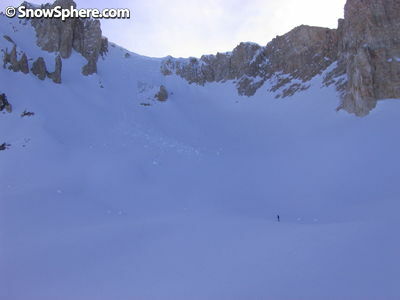 What grabbed our attention were the jagged peaks and dozens of chutes in the high alpine. We could finally see what attracts film crews and pro skiers from across the globe. We started studying the trail map to figure out which lines we wanted to ski and how we would access them. The rain in Bariloche hadn't followed us north, allowing us to explore the resort with clear blue skies. With a groomer or two to warm up each day, we set off to find the entrances to these remarkably steep chutes. The slow but steep Marte lift had some enticing lines beneath it, but we were both confused and disappointed that the entire bowl was closed until further notice. A local informed us this was apparently to keep the South American ski and snowboard tourists from hurting themselves in the current early season conditions. We questioned the patroller on duty, who advised us that we could ski beyond the boundary if we signed a waiver at the patrol hut. We didn't hesitate, signing our lives away and paying careful attention to the patroller speaking to us in machine-gun Spanish as to which areas were safe and skiable. We aimed for a run named 'Mercurio' and took off past the boundary signs. As long as we took the traverse early enough, we would end up back at the Urano drag lift. For every chute we had seen from the base, we found dozens more. The bowls were enormous with bulging cornices. With every lap we found countless other lines we wanted to ski, our four days gave us but a taste of the 3800 hectares the accessible backcountry of Las Leñas. The conditions were liken to spring slush, having to ski the aspects with most sun exposure to avoid ice. We weren't blessed with powder on this trip, but the terrain rivalled anything I have ever skied. We both vowed to return one day and explore it further. Like many remote ski resorts, development in Las Leñas has been slow. Most chairlifts are old style fixed double-seaters, very slow and occasionally having to close for maintenance issues. The resort is infamous for shutting down during snow storms, often for days at a time. There are no trees at this elevation (top of the highest lift is 3430m, 11253ft) meaning skiing in the alpine terrain is not possible when it is snowing due to high winds and poor visibility. There is a terrain park on the lower Minerva lifts mountain to keep you occupied on the alpine closure days. "Most of the people who go backcountry skiing or off piste are gringos". "Never before had I skied so much lift accessed backcountry skiing, and no one was around." Reviews like this are common place from foreigners that make the journey to ski here. Las Leñas truly is the jewel in the crown of South American ski resorts. Accommodation is available at the resort itself but is limited to expensive hotels. There are a handful of bars and clubs where partying often goes to the late hours. Many travellers opt to stay in nearby Malargüe (1 hour by shuttle bus), where there are affordable hostels and shops but very little in the way of entertainment. An attractive deal for budget skiers is that most hotels and hostels in Malargüe offer 50% discount vouchers for lift tickets at Las Leñas in an attempt to promote tourism in the town. The Argentinean people are a friendly lot, who are always willing to invite you around for a maté or asado (see below). Nightlife in Argentina doesn't begin until everyone's eaten (after 11pm) and nightclubs begin to get busy between 2 and 3am. If you're heading out after a day's skiing make sure to take a siesta for a couple of hours in the afternoon. Argentina's culture and in turn, its food, has been heavily influenced by European immigration. French, Italian and Spanish cuisine has all made its way into the gastronomy, but there are many unique specialties that can only be found in this part of the world. Argentina has a well-founded reputation for some of the best beef in the world. The popular Asado (meat grilled over charcoal) can be as good in a backyard barbeque as in a restaurant if you have an experienced Argentinean at the helm. This thick, caramel-like syrup is spread on almost everything at breakfast used in many cake and biscuit recipes. Try the dulce de leche flavoured ice cream if you get the chance. Pastries stuffed with beef, ham & cheese or dozens of other local variations. Usually served as starters and snacks or share a dozen with a friend for a meal. 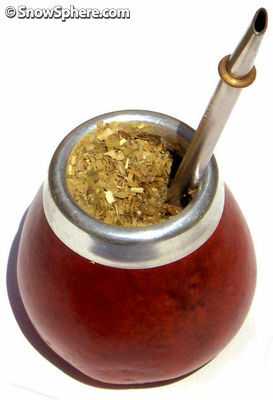 The national drink of Argentina, Maté is an herb infusion that is shared as an important social ritual. If you are offered this drink make sure not to make the gringo mistake of stirring it like a cup of tea, much to the horror of all your new Argentinean friends. Argentina is the largest producer of wine in South America and consumes 90% of what it produces. Stores have countless varieties to try each night. Look out for Malbec, a specialty from the Mendoza region. Air fares to and from Argentina are expensive, but once there the main travel expenses (accommodation, food & drink, entertainment etc) are quite affordable. Argentina's peso is still weak, making your foreign currency stretch much further. Argentina uses semi-cama (sleeper) buses as its main inter-city transportation. Don't get deterred from spending over 10 hours on a bus trip. The fares are cheap, you get decent food included in your fare and you have more room to sleep than on a 1st class flight. If time is against you, Aerolineas Argentinas offers reasonable fares to and from all major cities. Charter flights run on weekends from Buenos Aires to Malargüe. All access to backcountry lines relies on the Marte lift, which may not always be open. 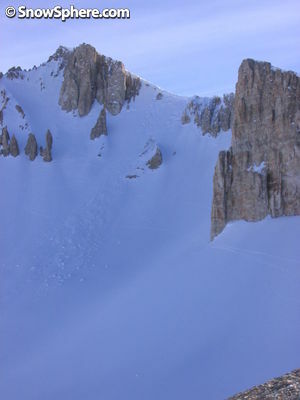 Locally-run Extreme Expeditions operate cat skiing tours around the backcountry bowls, weather permitting. Touring is possible to all these areas. The Las Lenas ski season runs from June to Late September, sometimes longer depending on snow conditions. 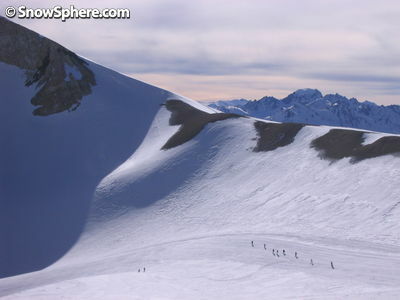 Vince Shuley is an Australian ski instructor who lives and works in Whistler, Canada. He shares his time between teaching skiing, travelling and exploring various ski destinations around the world. He is currently getting ready for another South American adventure.